The new Jeep Grand Cherokee is not your average SUV. This vehicle is exploding in popularity because of the functionality of the exterior features. The rear LED taillamps on the Jeep Grand Cherokee work to keep the driver and other motorists on the road safe too. 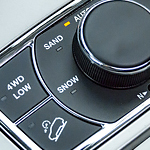 Regardless of the weather conditions, your vehicle will be seen for miles. The advantage here is you are also going to give other drivers the chance to bring their car to a stop sooner when they see your lights more easily. Your Jeep Grand Cherokee has Automatic High-Beam Headlamps that make it easier to be safe at night too. The lights turn on automatically, and they stay on until a vehicle is coming towards you. Then your headlights dim until the car goes on by, returning back to the high beams again. Give the Jeep Grand Cherokee a closer look when you come to our Jeep sales center to give it a test drive.